With proper treatment, people living with HIV/AIDS lead full and active lives, including traveling for business and pleasure. However, there are many things to consider if you are planning a trip outside of New Zealand. It’s important to plan carefully to protect your health and safety. Travelling around the world can involve new challenges and obstacles as many countries still restrict the entry, residence and stay of foreigners living with HIV/AIDS. This means that foreigners with HIV may be refused entry, denied permission to work or settle, or even be deported. If you are planning an overseas trip you must first check if the country you intend to visit has any entry restrictions for travellers living with HIV/AIDS, and if so, how this will effect your trip. A good place to start is to check the countries listed here. As restrictions on entry and residence for HIV-positive individuals can change quickly and with very little notice, it is a good idea to also check the international travel database - www.hivtravel.org - before any travel arrangements are made. IMPORTANT: Every attempt is taken to keep these lists up to date where possible. Should you notice anything that is not correct please contact us so that we can make the necessary changes. These countries currently either do not permit people living with HIV/AIDS to enter or may require a special 'waiver' to be obtained before arrival. Some countries may also deport tourists/foreigners found to have HIV/AIDS. These countries may have restrictions for people living with HIV/AIDS depending on their length of stay and may require disclosure of HIV status or demand mandatory HIV testing even for short term stays. These countries do not currently have any laws, policies or known practices that deny entry to tourists/foreigners based solely on their HIV status. Always carry your medication in your hand luggage - checked luggage might get lost or delayed. Always take some days of extra medication with you. You might not return as planned, for unforeseeable reasons. It is cumbersome to run after expensive prescription medication in a different country, and you might not even receive the drugs you are taking if in need. You may have to check specific customs regulation for importing your medication. In almost all cases, importing medicines for personal use would not pose a problem. To be on the safe side, carry a doctor’s prescription in English with you. The prescription should make no mention of HIV. Carry your medication in original packaging, labelled with your name. 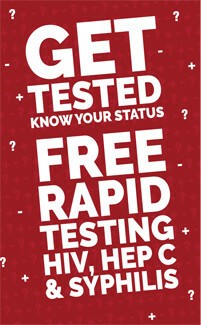 Do not disclose your HIV status unnecessarily. Not to other travellers, not to customs or immigration officials – it is not their business. Be aware that people with HIV are stigmatised in many countries. If you stay in a country for a longer period, or if your health is frail, make sure you know where the next HIV clinic is, or get the address of a clinician specialised in HIV. It might be a good idea to get in touch with a local HIV organisation. Most important: be aware that perceptions around HIV infection change from country to country. So if disclosure is safe in the country and community you normally live in, this might not be the case in the country you are visiting. In the past Body Positive had an agreement to act as an agent for our members and provide Travel Insurance for overseas trips. This arrangement worked well for several years, however we then found that the cost of these policies had become very uncompetitive and did not benefit members so the agreement was discontinued. Body Positive recommends Southern Cross Travel Insurance as they often have the best rates, with policies purchased online receiving for a further discount. When purchasing a policy online, simply select the option which states that you have a pre-existing illness which is not covered and you do not wish for it to be covered, this will allow you to complete the policy without declaring your HIV status. Issues relating to HIV will not be covered within the policy and it will not effect the rest of your policy if a medical issue should arise. Many countries including New Zealand have different and generally more restricted policies for foreigners who wish to stay for longer periods, work or immigrate permanently. In these cases it is always best to check with the nearest consulate or embassy regarding their policies on people living with HIV/AIDS. Check the Frequently Asked Questions for answers to common questions. More detailed information on the current restrictions and policies of each country can be found online using The Global Database on HIV-Specific Travel & Residence Restrictions, it is advisable to always check this service before you travel for the most up to date information available. It is always best to carry your medication in your hand luggage, in case your checked luggage is lost or delayed. Sometimes it is also best to carry a letter from your doctor stating that it is prescribed medication for personal use and always keep your medication in the original containers where possible so that customs officers can see that they have been prescribed to you. Make sure you bring enough medication for your full trip, plus a few days' extra in case you're delayed or change your travel plans. But don't bring an excessive amount, as customs and immigration officials may treat this as evidence of intention to overstay your visa. In the past, some positive travellers have chosen to take a treatment break while they travel rather than carrying medication with them. This is not recommended however as it can be harmful to the body and result in illness either while you are away or when you return. If you are considering doing this it is very important that you first speak to your doctor or specialist before making a decision. Obtaining replacement medication while overseas can often be difficult and very expensive, however local PLWHA Organisations may sometimes be able to help. It is a good idea search the internet before you travel and take note of any local PLWHA organisations just in case. If you can't find any then contact Body Positive as we may be able to assist. It can also be advisable to leave any medication you don’t take overseas with family or a good friend, so they can post it to you if you lose your baggage or medication overseas. They will need to include a letter from your doctor and a customs declaration. Advise them to send no more than a month’s supply at a time, as it may be confiscated by customs if they send more. Some positive travellers prefer to post their medication rather than carrying it their destination, either to a friend or family member or to their hotel. This is NOT recommended in most cases as it risks being delayed, lost or intercepted by customs. Customs officials inspect posted items. If you do choose to post medication ahead, you must make sure you include a customs declaration stating the parcel contains prescribed medication, for personal use only, without any commercial value. Enclose a letter from your doctor advising the medication is for personal use. The letter does not have to detail your condition. Travelling to a country to which entry for people living with HIV/AIDS is either restricted or not permitted is very very risky. To gain entry you will most likely have to lie on your arrivals documentation or visa application which could have serious repercussions. In most cases you will be immediately deported back to New Zealand if your status is discovered which could then seriously limit your travel options in the future. In some more extreme cases you may also be sent to jail until the deportation has been arranged. It is important that you consider the risks involved before making such a trip. Unfortunately there is little that can be done in regards to other countries travel and immigration policies. It can sometimes be possible to obtain a special waiver under certain circumstances for some countries by contacting their local embassy, however this can often be a lengthy and difficult process without a guaranteed outcome. In general the best strategy is to avoid these counties all together and to encourage as many family and friends to also do so. It may not sound like much, but many countries relay on income from tourism, so if enough people around the world stop visiting due to their stance on visitors with HIV/AIDS they may be forced to change their policies.